It’s time to put on whatever pair of kicks can survive the snow and rush to your nearest respectable sneaker shop … Sneaker Freaker issue 17 has hit the shelves. For those of you that don’t know what Sneaker Freaker is, I assume you don’t really like trainers. For those of you that do like trainers, I assume you know what Sneaker Freaker is. Issue 17 comes with a selection of 4 covers: Nike Air Max 1 QS Patta, Nike Air Maxim 1 Torch+ ND, Nike Dunk Premium DJ AM or a pair of Converse All Stars that I don’t recognise. The mag is also jam packed with forthcoming kicks (nearly 60 pages!) and interviews with the likes of Patta & No Boys Allowed. 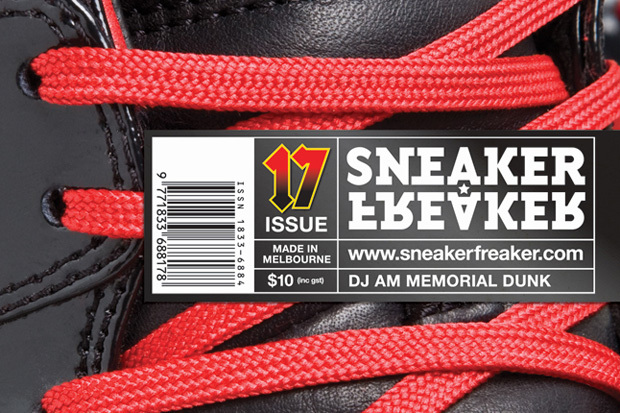 It’s a no brainer really … it’s an issue of Sneaker Freaker, so it needs to be bought and put on the shelf with all of the other issues in your collection. Simple.